SOME INVESTORS worry that America will face a recession in the next few years, after one of the longest expansions on record. Stock indices have fallen by 10% since early October. Yields on short-term government bonds exceed those of some longer-dated ones, often a harbinger of a downturn. Despite this, economic forecasters project GDP growth of about 2% in 2020. How much confidence should one have in these predictions? For the past 20 years The Economist has kept a database of projections by banks and consultancies for annual GDP growth. It now contains 100,000 forecasts across 15 rich countries. In general, they fared well over brief time periods, but got worse the further analysts peered into the future—a trend unsurprising in direction but humbling in magnitude. 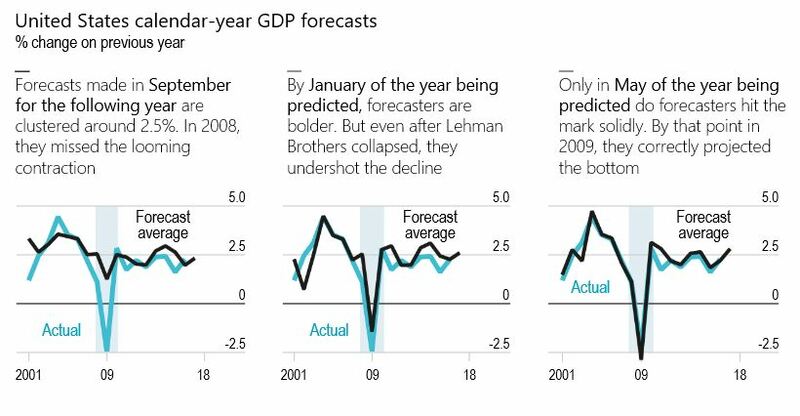 If a recession lurks beyond 2019, economists are unlikely to foresee it this far in advance. Economies are fiendishly complex, but forecasters usually predict short-term trajectories with reasonable accuracy. Projections made in early September for the year ending four months later missed the actual figure by an average of just 0.4 percentage points. Errors rose to 0.8 points when predicting one year out. But over longer horizons forecasts performed far worse. With 22 months of lead time, they misfired by 1.3 points on average—no better than repeating the previous year’s growth rate. Prices bounce around, emotion obscures logic, signals appear and vanish. The reasons for treating equities as a poor barometer for the economy are many. Right now, that might be for the best. Pools of gloom await anyone looking for a message in stocks. There’s the $3 trillion in value erased, the bloodbath in banks and the trouncing in transports. In wonkier circles, shrinking valuations and negative rolling returns have started to ring the recession bell. A relatively calm week in the Dow Jones Industrial Average just ended with a 495-point thud. It’s a pastime on Wall Street these days to look at the carnage, add it all up, and announce that the market is wrong. But what if it’s not? After all, even if equities have predicted “nine of the last five recessions,” as the economist Paul Samuelson famously said, that’s a better record than a lot of humans. Sure, markets overshoot, and sentiment gets carried away. Corrections like this one have occurred six other times since the bull market began in 2009. They all sparked growth scares. But none of them a recession. Still, anyone heeding strategist calls shouldn’t forget Wall Street’s propensity to lean bullish. Over the past two decades when stocks suffered two bear markets, professional forecasters have never once predicted a down year. Economists don’t see one now, either. Eighty-nine surveyed by Bloomberg generate an average prediction of 2.6 percent growth in gross domestic product next year. Also, see a related note on “There will be growth in the spring”: How well do economists predict turning points?